R & S offers fast, professional installation of industry standard hollow metal doors and frames, and all related hardware, to insure that your doors meet all applicable building codes. We also supply contractor packages for installation by others. Email us today for a free estimate or for more detailed information on our Hollow Metal Doors. Hollow Metal Doors and Door Frames are an industry standard in commercial, industrial and institutional construction projects. They combine durability with economy. Factory prepped to receive hardware and vision panels. Available in 16 GA or 18 GA.
You install or use our experienced installers. Quick Delivery for Most Common Flush Door Sizes. Constructed with honeycomb core, urethane foam core, vertical steel stiffened core; flush or stile and rail. Mesker Door offers a complete line of hollow metal doors in face sheet gauges ranging from 20 to 14. Doors are typically made of cold rolled steel or galvanized steel. All are insulated as standard with fully bonded, durable polystyrene cores (urethane, honeycomb and fiberboard are also available). The door line consists of the standard N Series (non handed door), Six-Panel, Steel Stiffened, Wood grain, 14 Gauge and Bullet Resistant. The combined durability and economy of these doors make them an outstanding choice for all of your hollow metal needs. CLOSER REINFORCEMENT: Every N Series door is furnished with a closer reinforcement box. EXTRA LONG LIFE: The key to the N-Series sag resistance is the extra long 3/16 hinge reinforcement. YOUR CHOICE OF FOUR CORES: Polystyrene, Honeycomb, Urethane, and Fiberboard. LOCK REINFORCEMENT: Thye N Series Door can be prepared for Govt. 161 cylindrical locks with a 2 3/4 backset (ANSI A115.2 lock front), or a Govt. 86 mortise lock with a 2 3/4 backset (ANSI A115.1 lock front.) N Series Doors are also available prepped for sectional trim, panic and electric devices. HEMMED EDGE: The hemmed edge of the N Series door offers an extra smooth transition between faces. Republic offers a complete line of standard and specialty hollow metal doors to fit your architectural needs. All Republic doors are available in 20, 18, 16, & 14 gauge cold rolled and galvanized steel. All doors come with a 3/4″ cell honeycomb core as standard, providing every door with a smoother, flatter, and stronger door. Republic honeycomb doors are available in a complete range of fire ratings (20 minute up to 3 hours) and are certified under both Underwriters Laboratories and Warnock Hersey/ITS. Doors are manufactured from stretcher level quality steel and are thoroughly cleaned and phosphatized inside and out offering excellent corrosion resistance and paint adhesion. Steel Stiffened – Vertical hat shaped stiffeners of 20, 18, and 16 gauge with mineral wool or fiberglass batting between stiffeners. 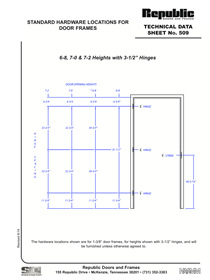 Stiffeners are welded maximum of 6″ apart and on 5″ centers. Republic´s DM series doors are available in 18 or 20-gauge cold rolled steel or galvanized (A60) steel. Republic´s “McKenzie Edge” lock edge is continuously lap seam welded and planished, providing a near seamless appearance – SDI levels 1 and 2 – Physical performance level A.
Republic´s DM series doors are available in 18 or 20 gauge cold rolled steel or galvanized (A60) steel. Republic´s “McKenzie Edge” lock edge is continuously lap seam welded and planished, providing a near seamless appearance – SDI levels 1 and 2 – Physical performance level A.
Republic’s DE series doors are available in 14, 16, 18, and 20 gauge cold rolled steel or galvanized (A60) steel. Face sheets are continuously projection welded to hinge and lock channels on 5″ centers. 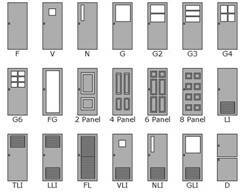 SDI Levels 1, 2, 3 and 4 – Physical performance level A, B, C, D.
Commercial Steel Door Performance with Decorative Panel Designs.â€¨ Republic offers a wide variety of embossed panel insulated doors such as our traditional 6-panel design, 8′ 6-panel design with elongated panels, 2-panel colonial design, 4 panel, and 8 panel designs. 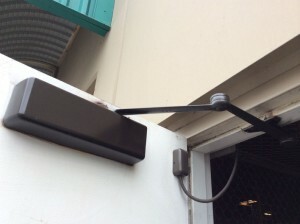 Doors are available in 18, and 20 gauge cold rolled steel or galvanized (A60) steel. Face sheets are continuously projection welded to hinge and lock channels on 5″ centers. SDI Levels 2 and 3 – Physical performance level A.
Republic′s Unifit™ series doors are available in 16, 18, and 20-gauge cold rolled steel or galvanized (A60) steel. Face sheets are continuously projection welded to hinge channels on 5″ centers. 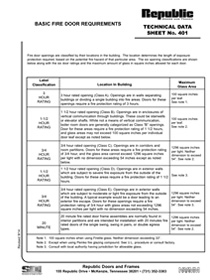 SDI Levels 2 and 3 – Physical performance level A.